If you’re in college and are absolutely bombarded with ‘career-making advice’, don’t stress. We’ve all been there. And so, we’ve put together a list of top ten skills you need to know. Now, you can conveniently drown out all that unwanted advice and work determinedly towards the path you’ve chosen. 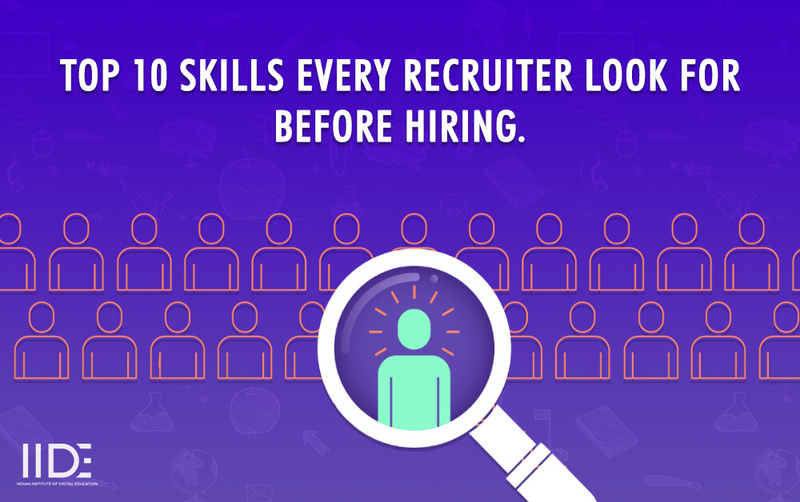 Here are the top 10 skills that every recruiter look for before hiring any candidate. Influencing people using just your words is a skill that can come in handy not just while giving your viva voices and college presentations, but will show its worth throughout your life, in both personal and professional aspects of your life. If you can master this skill, 50% of your work for an interview or assessment, later on, is already done. No matter where you work or which field you’re in, the MS Office Suite is one skill that will always serve you well. Any official work in most modern offices is performed on these portals—everything from bookkeeping to presentations, it all relies heavily on how well you can perform in these systems. Keep yourself updated with the latest changes in MS Office, as they’re going to make an impact on every piece of work that you do, for college or professionally. This is surely counted as of the most important skills recruiters look for. You need to be programmed to think a certain way in order to solve problems analytically. This is especially useful if you ever need to attempt competitive exams in the future or have mathematics as one of your core subjects in college. In order to hone this skillset, it’s advisable to solve a few problems from CAT/GMAT preparation books every day, whether you plan to take the exams or not. What comes first—the product or the consumer? You can go in circles trying to figure out the answer, but you should always know: Unless there is a pre-existing market for your product, it will not sell. If there is no demand, there is no one to sell to. So always make sure to understand what exactly market research is, and how to perform it accurately, in order to produce just the kind of thing that your target audience will take to. Unless you’re living under a rock, you know what social media is. Thankfully, this is a skill most teenagers these days are usually well-versed with. Parents are unhappy about the number of hours being wasted on mindless scrolling, but remember, it’s only unproductive if you don’t learn how to monetize it. Understanding how social media works in this age is essential. Learning how to sell on it is a leg up. But either way, you need to be in touch with the latest social media trends! When you search for something on the internet, I bet you not often go past the first 3-4 results on Google. This means that, if your webpage or blog is not one of those first few results, the chances of it being seen by your target audience are slim. Don’t worry, there are ways to change this—and they’re part of search engine optimization, or, in other words, ensuring your website places (or ‘ranks’) as high as possible on your audience’s results page. These techniques are a must to know in today’s digital-centric environment if you want your business to be seen by as many possible. Learning digital marketing is not just an extracurricular course, but a skillset on the basis upon which you can build your entire career. Not convinced? Well, digital marketing skills were one of the top five highest-paying skills last year, if that sweetens the pot for you. And one of the biggest benefits? You can switch industries whenever you want—because every line of work requires digital marketing! Regardless of which field you’re planning to step into when you graduate, it is strongly suggested that basic Photoshop is a skill you should pick up. It’s always a bonus when you’re able to design your own visual instead of waiting around. But more than that … think of your professor’s face when your class gets to see the killer presentation you designed with the help of your new skill! It’s no secret that everything is going digital. This means every company must have a website! And of course, it’s coders and website developers who construct these websites. HTML and CSS are beginner-level coding languages, and two of the simplest ones to pick up—and remember. A few hours invested in this will pay off royally when you have the knowledge to design your own theme for your business’ blog—or your college Computers project. Simple web design and code just doesn’t cut it anymore—consumers have come to expect a smooth and bug-free website if they’re going to respect a brand. However, the smoother a website, the more complex the code behind it. This is why web development is a booming industry to get into right now— not only can you develop state-of-the-art web pages, but you can make them look great too! If you have a keen eye for design and a code-friendly mindset, this might just be the career you’ve been looking for. Feel inspired to pick up a skill yet? Well, we can help you with that too. IIDE’s courses cover all of these skills—and more! We have a 6-month program in digital marketing and full-stack development, as well as short-term courses teaching a variety of skills like social media marketing and search engine optimization. Click here to give your career a jumpstart now! You missed one important skill – POSITIVE ATTITUDE…can be developed as well!